I've struggled with whether or not to write this, but things will be obvious over the next year, and because I do my own stunts in front of the camera here at the Oldwolf Workshop there will be no hiding the changes. So this is an effort to cut past a hundred separate conversations to one. Next week I will be undergoing a surgical procedure known as Gastric Bypass. Essentially the intention is to surgically shrink the size of my stomach by ninety percent. If you want to know more the Wikipedia entry is very thorough. Because of this I should see significant weight loss in my near future,and admitting it now will lessen my immature (and inappropriate) response to claim I'm undergoing chemotherapy or high colonic cleansings. But why do that, just eat a salad fatty. I can hear it even if it isn't said out loud, but it's only half the story. i've always been a big bruiser of a person. As a senior in High School I was strong and svelte with a six pack and still weighted in at 190#. After high school I gained weight, but was able to stay active and comfortable. Several years ago I blew out my knee and it was the start of a bad cycle. The thing about the weight isn't just social acceptance or fitting into an airline or auditorium seat. The thing no one discusses is the pain. Up until a few months ago I had reached a point where everything I did hurt. I know cry me a river snowflake, but the pain isn't short term "oh I passed a kidney stone" it's chronically grinding and never ending. It makes every effort cost you twice as much and alters the scale on which you weigh just how much anything is worth it. The toughest challenge is admitting you're not enough all by yourself to keep slogging through and gain any measure of sustainable success. I can see the lighthouse but I need help to turn this ship around. After several years of discussion with my doctor and my wife, this is my best option and once the decision was made to pursue surgery it was still almost a two year process to here. This is anything but a rash and quick fix decision. I work in surgery, I have for almost 20 years. The only outcomes I ever see are bring back complications and usually bad ones. If I'm honest I'm scared to death about this, but I'm so tired of battling the grinding pain everyday I will face anything. The upsides of losing weight, resolving diabetes and high blood pressure and living a more comfortable, possibly longer life seem better than a poke in the eye too. After next week I will be on weight lifting restrictions for four weeks. That limits what I can really do in the shop. Maybe I'll sharpen a few saws. I also picked up some models to put together in between scheduled walks and high protein meals. I'll keep myself busy and it's possible I'll write more here too, catch up with some of the things I've accomplished without recording here. Mostly I hope I can mangle my concentration down to read. I haven't managed to do more than scan the newer Roubo Tome from Don Williams and company. It's time I fixed that. 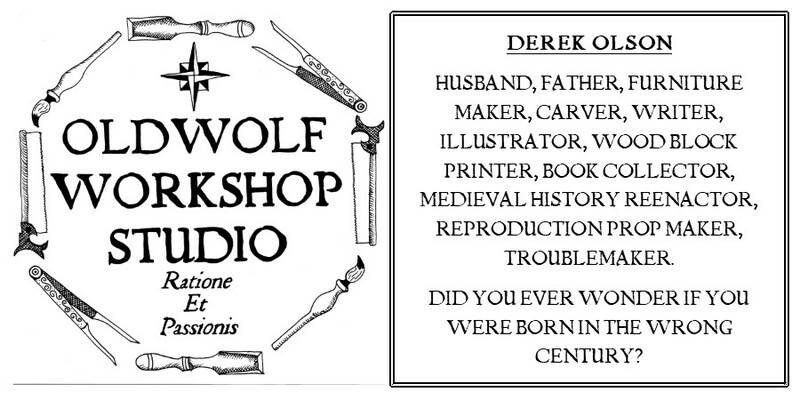 So from here on out it will still be the Oldwolf Workshop, only concentrated, with less fillers. Good luck Derek! You are a tough muther (that's a compliment). I know you will pull through with grace and verve. I have the opposite problem - I can't gain weight if I tried. Of course, eating healthy like I do and exercising a lot helps. I don't say this to taunt you. I applaud your decision. 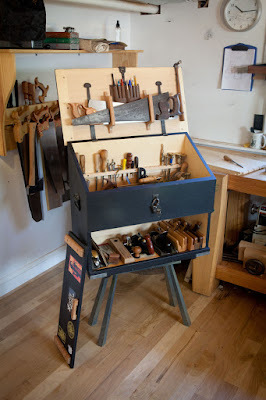 I'm 58 years old and worry about being able to continue woodworking well into my 70's an hopefully 80's. But I struggle to keep weight on and keep strong. You and I have the same goal - keep healthy enough to enjoy our hobby and life in general as long as possible. As the Aussies would say - good on ya'! I've been very lucky with just staying low carb, I expect you will need to do the same after surgery. Good luck, I know it was a hard decision but apparently needed. I can relate to on going pain for the last three months I've been in level 5 to 7 pain because of my back....It is all consuming and all you can do, think, or talk about. I had surgery yesterday and a whole new pain free life today. Derek, as one who has been heavy my whole life, I ger it. I had a heart attack and four bypasses twenty years ago at 44. I went from 293 down to 223 in a few months. But you know, my mind has this idea of what is "normal" and I have found way too much of the weight I lost. My sister had the bypass about 25 years ago and has kept it off pretty well. Nothing feels better than to feel in control of your life. You will be fine. Stay in touch. You are very brave. Best of luck with this, and may the results exceed your expectations in a good way. Best of luck with the surgery, and kudos for taking such a tough decision. Thanks for sharing this Derek. Good luck and best wishes. Good Luck with this Derek! I understand your response to the pain. Over the past 25 years I watched what's happened to a relative I love very much as she has been stuck in a cycle of serious injury (shoulder destroyed while skiing), weight gain, chronic pain, two knee replacements, spinal stenosis which finally froze her spine to the point that pain has thankfully receded - - yesterday she had the shoulder which was originally injured replaced, as she has become unable to lift that arm. Through it all she has tried unceasingly to become the active, athletic person she still feels she could be. Heartbreaking to see; how much will she be able to recover in her mid 70's? You are right to take action now. I am hoping your awareness of all the potential outcomes can help you steer the right path. Good luck cousin. And I will toast to your health! Hope your recovery is swift and that it results in a healthier you. i look forward to many more posts from you in the future, your brave share here is an inspiration. full of risk, ready to make a change, and going for it, full stop! i salute you oldwolf! Best of luck! Just getting the weight off will help the knees and other joints. I got pretty heavy a decade ago when I stopped smoking and the joints really ached and creaked until I took the weight off. Helps the ticker, too. You're making the right choice to get healthy. Good luck. Get right as rain soon. I like the idea of sharpening tools. Wish I had thought of it after the last surgery, instead of sitting in a chair watching TV. That Which Catches The Eye?